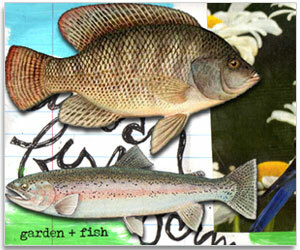 Applied Aquaponics is indeed our inspiration. They are doing exactly what we see doing and have help us to realize that our vision and dream are realities. The Casa De Esperanza project was a large aquaponics project installed at a home for battered women and children just outside Ensanada, BC. They combined the simple aquaponics philosophy as a substantial provider of vegetables and protein to those who need it the most. In December 2009, an outreach team from Calvary Chapel Costa Mesa installed an Aquaponics system at a home for abused women in Ensenada, Mexico. Using available materials along with river pebbles and a solar panel to power the pump, the system will soon be able to provide fresh fish and produce for 50 people every week. Encouraged with these successful results, Jacob is now developing an educational curriculum explaining how God created a wonderful system between plants and fish in order to produce a source of healthy food, how this system can be built with available materials and how to maintain a balanced, nutritious diet practically anywhere.
" My husband started an aquaponics system in our yard and not only is it a sustainable way to grow vegetables, it is fun to watch." Find out what is going on behind the scenes and in your neck of the woods!